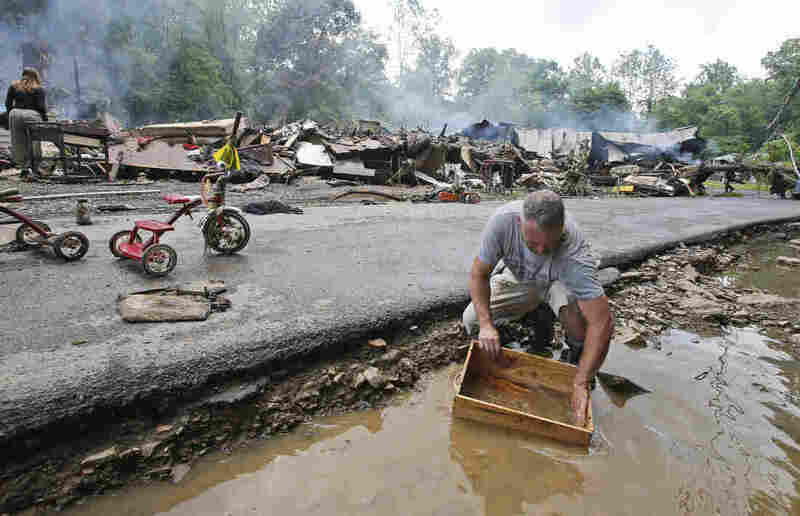 Historic West Virginia Flash Floods Kill At Least 23 People : The Two-Way Flooding across West Virginia has killed at least 23 people and seriously damaged or destroyed more than 100 homes. It's the worst flooding in a century for some areas of the state. Two days of flash flooding across West Virginia have killed at least 23 people and seriously damaged or destroyed more than 100 homes, according to the governor. The flooding caused by nine inches of rain "is among the worst in a century for some parts of the state," says Gov. Earl Ray Tomblin. "The flash floods have tremendous power – we have reports of boulders in the middle of downtowns, people were literally running up trees to escape it. And then some stories of amazing heroism, of first responders rescuing a woman who was up to her neck in a car before she drowned. So it was fast, it was furious, and now it appears to be receding." The storm also "trapped 500 people in a shopping center when a bridge washed out," according to the Associated Press. "Dozens of other people had to be plucked off rooftops or rescued as waters quickly rose during the deluge," the wire service adds. 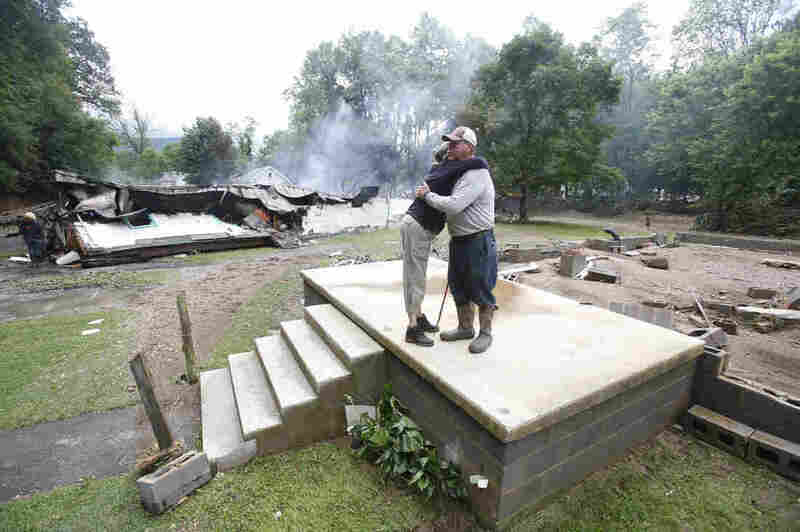 "Roads destroyed, bridges out, homes burned down, washed off foundations," Greenbrier County Sheriff Jan Cahill tells the AP. "Multiple sections of highway just missing. Pavement just peeled off like a banana. I've never seen anything like that." Mark Lester cleans out a box with creek water as he cleans up from severe flooding in White Sulphur Springs, W. Va., on Friday. Among the dead is a toddler, Finn says, "who waded into 1 foot of water yesterday — floodwater — and was swept away." Finn says authorities searched for the child through the night and found his body this morning. He adds that there are concerns there may be more fatalities in areas that rescue workers have yet to reach. Tomblin has declared a state of emergency in 44 counties. As Finn explains, that comprises "basically the entire state of West Virginia, except for the Northern and Eastern panhandles of the state. And that's because the flooding was widespread." Tomblin tells reporters that the biggest challenge at the moment is high water, as rescue operations continue. Some 66,000 people are still without power, he says. The governor adds that he expects the "active phase" of this crisis to end today or Saturday. But after the storm ends, "there will be an enormous amount of recovery work." Video posted on YouTube shows a street turned into a river with a rafter floating down it in Elkview, in the western part of the state. The floods also hit The Greenbrier Resort, which is set to host a PGA event in less than two weeks. A video posted on Twitter showed brown water rushing over the golf course.